Sweet strawberries top a perfectly crunchy and chewy meringue to make this delicious strawberry pavlova recipe. Light and fresh, it’s the perfect springtime dessert for Mother’s Day and it’s elegant and decadent enough for weddings and showers, too! Create the perfect Pavlova every time with these tips and tricks! Looking for something special to make for Mother’s day? Maybe even a gluten free dessert? 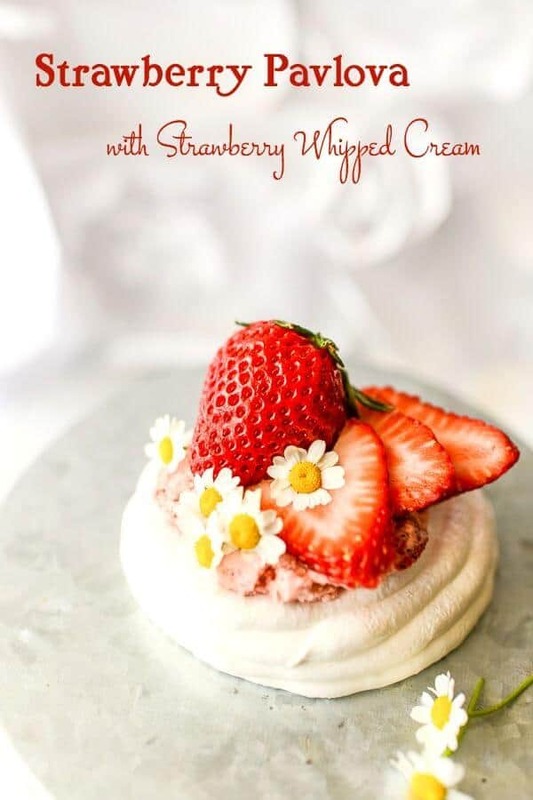 This strawberry Pavlova recipe with strawberry whipped cream is easy to make, delicious, and takes advantage of those gorgeou, fresh strawberries coming into season right now. Pavlova is a dessert made out of a large crispy, chewy, light meringue shaped into a dish, and filled with fruit and strawberries. 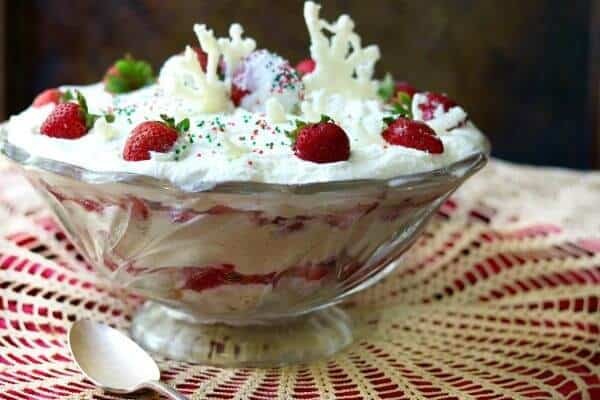 It was named for the Russian ballet dancer Anna Pavlova, and the earliest record of a pavlova recipe indicate that it was invented in the 1920s, after one of Anna Pavlova’s tours to Australia and New Zealand. Pavlova is a naturally gluten free dessert, but absolutely everyone will love the fruit and cream filled meringue, with its sweet, fresh flavors and mix of textures from crunchy to marshmallow-y! Choose a dry day with low humidity. Bake on parchment paper so the meringue won’t stick to the pan. Make perfectly sized and perfectly round pavlovas by tracing a round shape in pencil on the parchment paper. I used a cookie cutter, but you could use a glass, or even a plate. Trace the circle with pencil, but then turn the parchment paper over, so you see the pencil markings through the paper. Otherwise, you will transfer the graphite pencil lines to the bottom of your pavlova when you peel them off the paper. Use a LARGE disposable piping bag to hold the meringue. Trying to refill a tiny piping bag is very messy work. You can also shape the pavlova with just a spoon, if you don’t have a piping bag. Dollop the meringue on the parchment paper and use the spoon to spread the meringue into a dish shape. It’s easiest to bake pavlovas at night, so rather than guessing when the pavlova is completely cool and ready to come out of the oven, you can simply let it cool, undisturbed, overnight. No guesswork, and it turns out perfect every time. Garnish the finished pavlova with some edible flowers for an elegant, perfectly fresh and springy look. Pavlova meringue shells are traditionally filled with whipped cream and fresh fruit. I particularly love using all natural strawberry whipped cream and sliced fresh strawberries. 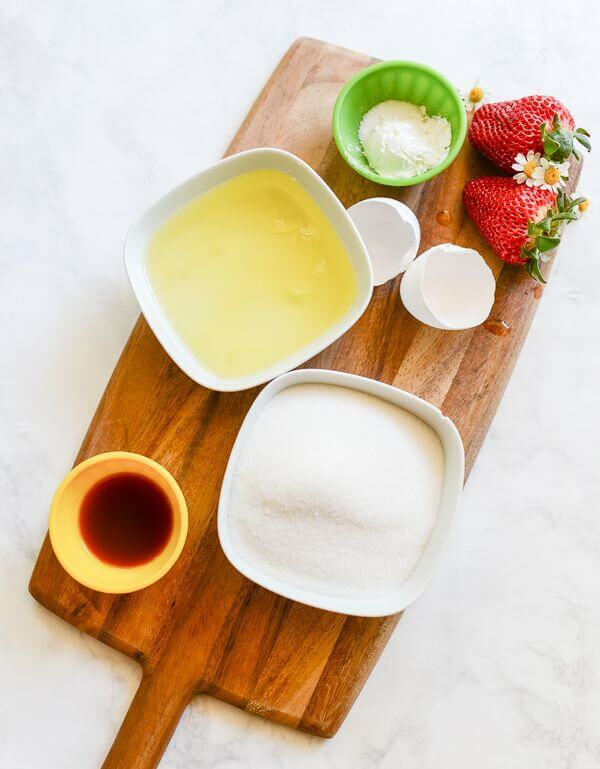 Try adding extra flavor and flair to your pavlova by experimenting with other spreads and flavors, too. Nutella, perhaps? Or lemon curd? What would you put in your pavlova? If you’re making the Pavlova ahead of time keep the shells in a cool, dry place and assemble your Pavlova just before serving. You can make it in individual sizes as shown here or one big one. If you like this recipe please give it 5 stars. 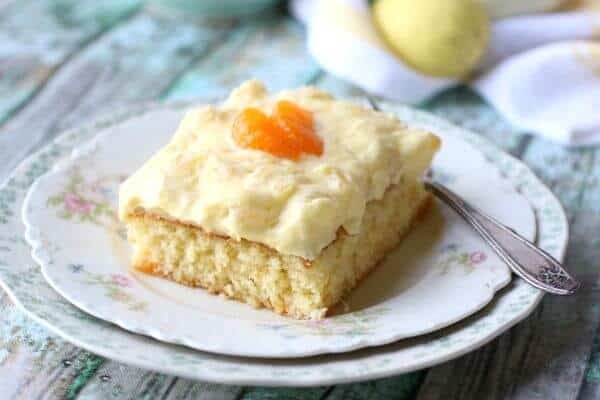 A light, sweet springtime dessert that's elegant enough for weddings but easy enough for a special Mother's Day brunch! 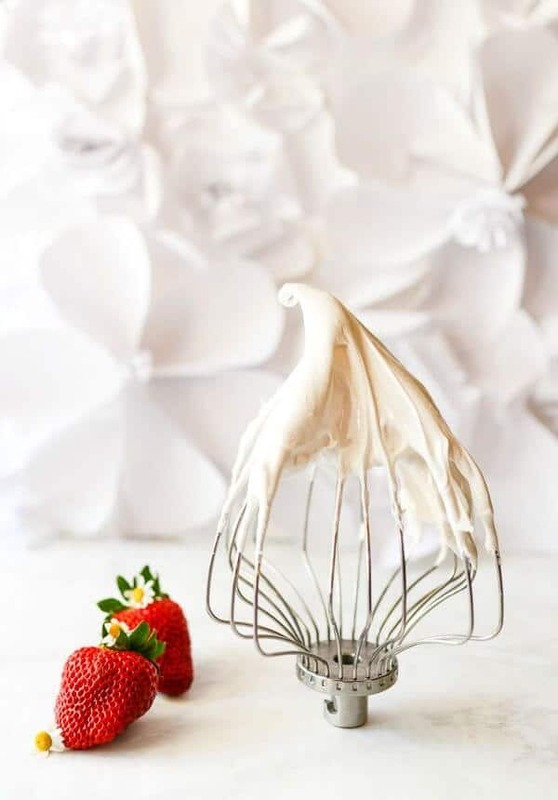 Use the whisk attachment for your mixer to whip the egg whites until they turn into a frothy foam. Add the sugar, bit by bit, beating all the while. Add the vinegar, cornstarch, and vanilla, and beat at a high speed until the mixture stands in firm, shiny peaks. 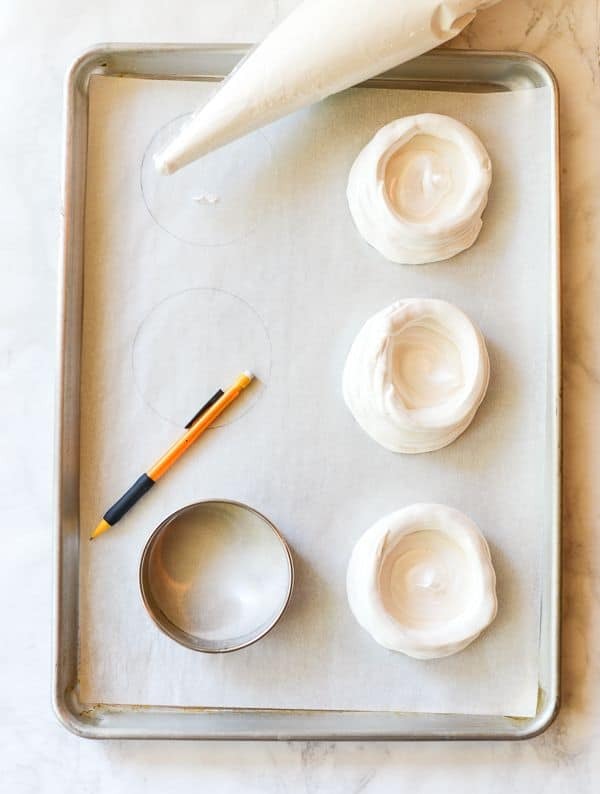 Pipe the meringue into a bowl shape on parchment paper. Bake at 200 degrees Fahrenheit for 90 minutes. Turn the oven off, but don’t open the oven door. Let the meringues cool down completely before removing them from the oven. Top the meringue with the strawberry whipped cream or plain whipped cream. 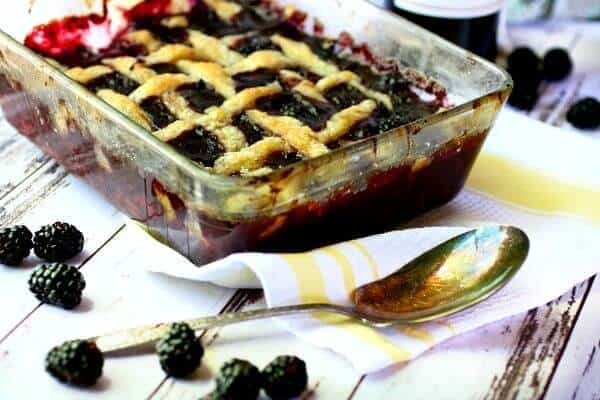 Can be made ahead but don't add the whipped cream and berries until just before serving. Pavlova looks so cute. I am planning to make this. Not sure if it would turn out so good.